Christian was so excited when he saw it. He's so into cars right now. He said something about Lightning McQueen (a cartoon character-car) and I really didn't catch the rest, but I think that's 3-yr old for "I love it." Happy birthday to my sweetie-guy. We love you. ps- Just as I was finishing up this post (12 AM) I heard a knocking form his bedroom door & I went to get him. He was standing there, "Mommy, I choked up on my bed." = vomit in bed. yummy. Happy birthday Christian! Lauren, Lightning McQueen is a god here at our house. What is it with little boys and L.M.? Seriously, we need to buy stock in Disney. Your neighbor is fabulous--mojitos and mad cake skills? Happy 3rd Mama Anniversary. Isn't it the best? That's darling!! I have a goal of making all my kids' birthday cakes and I'm sure many of them will look eerily similar to your little guy's! Perfect cake! I love it. Lauren, how adorable, and what a great friend! Happy birthday to your little guy! The cake looked great and besides, the messiest looking cakes taste the best anyway!!! happy birthday to you little man and his big wheels. hope he feels better - and has a smooth ride today. Aww. Happy b-day Christian! Lauren, I adore your tell it like it is posts. They make me smile and make me feel like I'm not alone in this adventure called motherhood. I am especially excited to learn that another child says 'choke up'. My son used to say, 'I had a little choke up!" and it used to make me laugh! the cake is perfect! Sorry for the midnight visit. Mine arrived at 3:00 AM to annouce he had "spitties". Poor things, I hope Christian and my eldest are on the mend soon! Love the car cake! Your posts are the best!! My 20-year-old college student still loves and makes Fun Fetti Cakes (pardon the spelling). I have to tell her about no icing on the sides, hey that saves calories. In fact thinking about it, my mom loved them too. Love your great blog. Happy Birthday Christian. I love your hair. I could tell it was a car, hah. Hope his tummy feels better. Hello! All mamas know that home made cakes taste SO much better than store bought, so kudos to you!! Hey, Lauren, loved your feature on SRT today, great to hear you, since I'm a big fan of yours too. Awww...I love his Harley tee. Happy Birthday Christian! I love funfetti cakes too! And congrats to you on 3 years of motherhood! I love that you didn't have some crazy-over-the-top bday party. Those can come later, when he'll actually remember. I'm also loving longer hair ("surfer hair") like his on little boys. So much cuter than buzzcuts! What a cute cake! 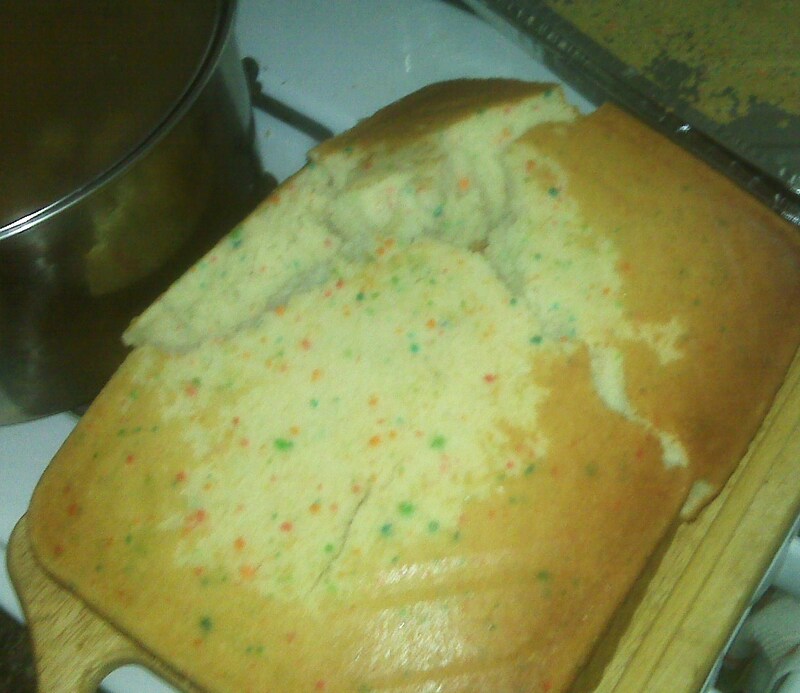 I'm sure it tasted amazing too- funfetti cake is the best! What a sweet neighbor you have! The cake looks great - I'm sure that funfetti looked even better in his bed! Im sorry that's never fun, but it will make a good memory of him to remind him of when he's older! Lauren, you and your friend did an amazing job! Enjoy all of those precious years with your small children because in a blink of an eye, they will be grown and you stop and wonder, "where did the time go?" There is nothing better in life than a young family. God Bless you all!